From left Ilaitia Vuivuda, Josaia Leone and Nacanieli Bakata. A search was underway for three prisoners who escaped from Police custody yesterday morning. The three, Nacanieli Bakata, Ilaitia Vuivuda and Josaia Leone were remanded in Police custody for aggravated robberies. Police spokeswomen Ana Naisoro said they escaped from the Nadi Police Station. Moreover, an Internal Affairs investigation is also being conducted as to how the three escaped from lawful custody and an officer has been suspended pending the outcome of the investigation. 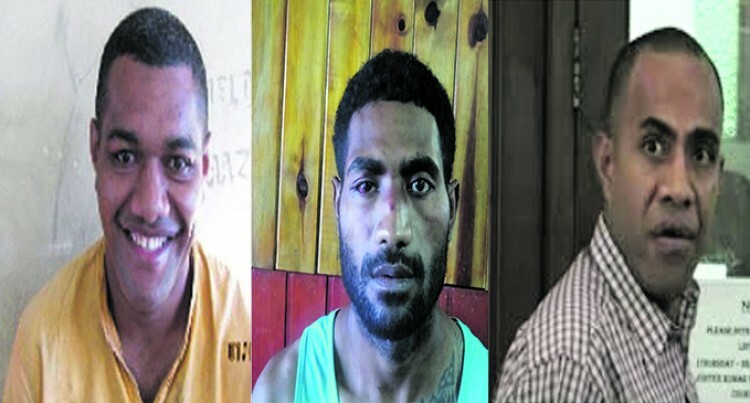 Police is requesting the general public for anyone with any information on the escapees to call Crime Stoppers on 919 or the Nadi Police Station on 9905 607. When this news went to print, Police were still searching for the escapees.